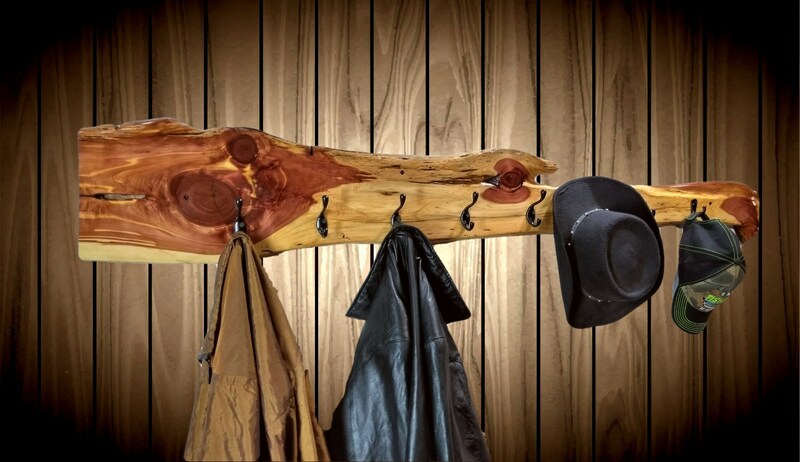 Live Edge Rustic Knotty Red Cedar Coat Rack With Lots Of Character. Very Beautiful, Clean Piece With Appeal. Comes With 5 Double Hook and 3 Single Hook, Black Hangers. Hangers Are Spaced at 6” Centers Making Plenty Of Hanging Room. Very Beautiful Grain. Three Coats of Polyurethane and a Coat Of Hand Rubbed Wax. A Very Unique Piece Of Nature. Four Mounting Holes Spaced at 16" Centers. Comes With Drywall Anchors and Screws. Handcrafted Cabin Decor, Rustic Home Style Gift Shop. Uniquely Made Items with Careful Attention to Detail and Quality. We strive to make every item unique and individual. A true one of a kind piece. Our items are intended to last generations. Pass One On To Yours. Yes, I do many custom orders. Please don't hesitate to ask. 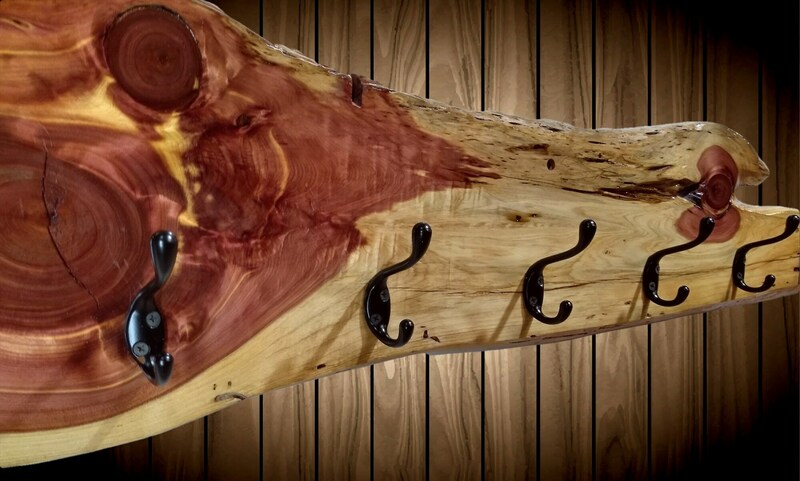 Together with your ideas and my wood experience, we can make a unique gift memorable and last for generations. Yes. I guarantee you'll be happy with your order or I will take it back in like-new condition within 3 weeks. Most all of our products ships in 1 to 2 working days. We normally ship USPS EXPEDITED . By doing this, your package will be delivered in 4 to 6 working days from date ordered. We take pride in our shipping. Each box is custom made from double corrugated cardboard to fit the product. Each product is bubble and or foam wrapped then shrink wrapped. All boxes are marked with bright red and white tape “Fragile” This usually guarantees a safe arrival. This functional work of art looks like it was made for this wall in the foyer of my log home. Shipping was fast and the packing was carefully done for maximum protection. Very happy with the purchase and I will buy from this seller again.